Floating houses could be an answer to big-city population problems: cities like London, Tokyo and Shanghai, with plenty of water around and little room to spare, could benefit from this method of building. 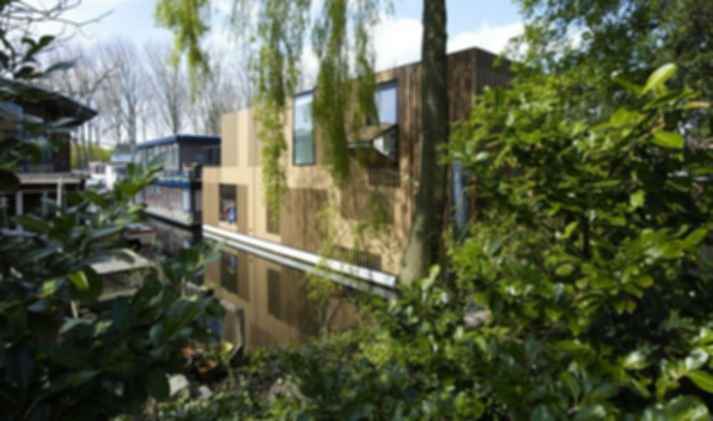 It could also provide a solution for cities prone to inundations and tsunamis on their coasts - building homes that could withstand sudden floods could prove beneficial. Also, as they're not grounded, most of them need to be self-sufficient, or benefit from self-sufficiency for safety reasons (electrical grid connections could prove dangerous for a floating house, for example). But what methods are there to design floating houses? There are different ways to do it- and there could be more in the future, as this way of constructing is just starting to be explored by architects around the world. House Barges are the easiest way to build a floating house; they're not boats modified to be used as housing solutions, they're houses designed with the same principles that make boats float, but they don't have power to move by themselves- they just float. The house is prefabricated on dry land, then placed over an horizontal platform that doubles as a floor and the supporting structure that ties the house to its floating device. The floating device is a structure consisting of a series of hollow air containers shaped in a way that allows them to float; once attached to the platform, they allow the house to float on water and be stable. The configuration of the floating device will depend on the area of the supporting floor structure; sometimes they're in rows one next to the other, and others they're placed in opposing pairs- think of two small boats with a plank and a house on top. The configuration depends on how large the built surface is, the weight of the house and its structure, and how stable the house needs to be kept (houses by the shore and houses on lakes need different stabilizing methods, due to water movements). These houses have great potential to be eco-friendly, as they need to be self-sufficient when it comes to producing electrical energy and potable water. Their waste is not thrown into the sea, but stored into containers, and potable water can be fetched and filtered from its surroundings. Houses on pilotis aren't exactly floating, but because they're in full contact with water at times, or all the time, they're considered as floating houses. These houses, unlike fully floating houses, remain in one place and don't require stabilizing methods to prevent them from floating adrift or tipping over, but they represent other challenges. Since they come in direct contact with water, they must be well insulated against humidity; if the pilotis and the house are made of wood, they must be thoroughly coated and treated against humidity, fungi and other related corrosive agents- this prevents humidity irrigation to the walls and floor and prevents the rotting and collapse of the structure. If the pilotis are made of steel, they must be treated against water corrosion regularly, using waterproof paint and sealers. Floors must be also properly insulated to prevent infiltration. Some fixed floating houses are not placed on decks, however. Some are placed on massive concrete structures filled with expanded polystyrene, called flotation billets. Flotation billets act like giant buoys that keep the structure stable and minimize collapsing hazards and humidity infiltrations to the house. Do you have experience designing a floating house? What are the pros and cons of floating structures?